I WELL remember Aston Broad Lock before it was 'improved' and was so easy to use, writes Debbie Clarke. It had long steel beams and in those days, I am going back about 18 years, the gates were well balanced and so the lock was very easy to operate, as in fact were all those of what you now so rightly call the 'dreaded six'. Then what my husband called a team of idiots supposedly 'improved' the lock and made it just about the worst to operate on the whole Trent & Mersey Canal. The continued 'improvement' since then has made all the six locks difficult, and like your lady, I too have had to leave bottom gates open as try as I might I just could not move them, but not only this, from having 'loose' paddle gear in the past, too many are so tight I have to use our long handled windlass, taking if off and replacing it, as it will not go pass the lock beam, to get the paddle to wind up. My writing has been prompted by the comment yesterday about the exodus from Sawley to Mercia by boaters when the latter first opened, and which has continued, our being one of them, and your picture of the empty berths that are left clearly show this, as having to work those six locks to get onto the rest of the canals proved too much for many. I know that going on the Soar is an alternative, but again like you, we have been caught when it floods, which is the reason it is not so popular. 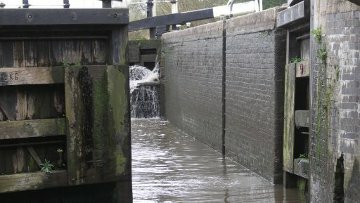 I understand that the health and safety rules lay down the maximum weight that the public is allowed to lift, hence the old 1cwt bags disappearing, but if this also applies to pushing/pulling objects, the force needed to move many of those broad lock gates must well exceed the definition of the rules.